Soto have announced that they’ll release a new studio album later this year. 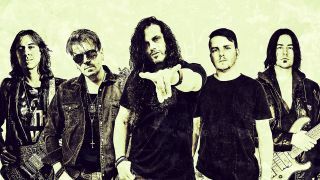 It’s titled Origami and follows vocalist Jeff Scott Soto's work with Mike Portnoy, Derek Sherinian, Billy Sheehan and Ron ‘Bumblefoot’ Thal in Sons Of Apollo. The record will be released on May 24 after the band singed a new deal with InsideOut Music. And, to mark the news, Soto have released a lyric video for BeLie, which can be listened to below. Soto says: “This is a song co-written with a long-time collaborator of mine in Brazil, Leo Mancini, along with my drummer Edu Cominato. Origami will be released as a limited edition digipak CD which will contain the bonus track KMAG and three stickers, 180g vinyl and on digital and streaming platforms.